It’s a Saturday night and you’re looking for a good place to eat, or you’ve just moved to a new city and are in search of a hairdresser. The days of trusting “walk-ins” are becoming something of the past. We want 5 star ratings, detailed reviews, and photos of validation before we call to make a reservation or appointment. Instant review-based decision making has impacted the success and failure of local businesses around the world all thanks to one platform - Yelp. Why Is Yelp for Business Owners Important? Any business owner who’s ever dealt with bad reviews, probably wishes they could turn a blind eye - but Yelp is a powerful tool that need to be embraced rather than ignored. At 171 million Yelp reviews and counting, it’s clear Yelp and its users aren’t going anywhere anytime soon. The reviews your company receives can be the difference between sustained success and immediate failure. As a small business owner, how can your business find its way to the top of potential customers’ Yelp searches and earn good reviews? Here are some actionable Yelp marketing tips that will help improve your Yelp listing to attract more business without costing you money. First, you need to ensure your business is properly listed, set up, and optimized for success. This step is simple. Type your business name into Yelp, if it doesn’t appear you will need to add a new listing. Go to the Yelp for Business Owners Page and enter in your business details. Fill in your business name, contact information, and categories. 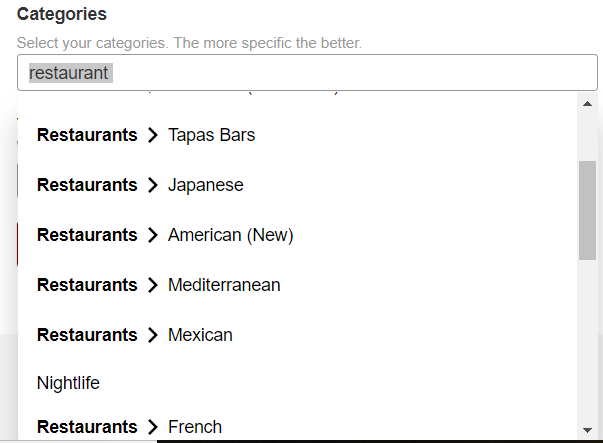 Don’t skip over the categories as these will help people find you when searching for businesses listed within a specific category (i.e. restaurant, tapas). The more specific you are, the better. Your Yelp business listing may take a day or two to be approved. Once approved, you will receive an email that will allow you to access your listing. If you type in your business details and find that a listing already exists on Yelp, you will need to claim it. Many times a business is already listed because a customer has left a review. If your business already has a profile with a few reviews on it, you will need to follow these steps in order to claim it. Go to Yelp for Business Owners Page to claim your business. Once your business is claimed and you’ve set up a Yelp Business Owners Account you are ready to start building a fantastic Yelp profile. *Please note that it is important to claim your business. If left unclaimed, anyone can go in and update your listing profile and add information. Now that your listing is claimed and your Business Owners account is set up, you can start building and customizing your profile. Before you start optimizing your profile, we recommend spending a little time on some of your competitors’ listings. In order to find your competitors, type in your main search keyword. If you’re a Boston seafood restaurant, type in seafood, Boston. Who are your biggest competitors on Yelp? Take a look at what people are saying, what types of pictures do they feature? What keywords are they using? How do they interact with customer reviews? Getting a solid lay of the land can help you not only size up the competition but understand what it takes to rank for a high Yelp position. Just as you want your customers to be “wowed” when they physically walk in to business, your Yelp page should display the same sentiment. Yelp Profile Details Filling out your profile in its entirety is important. Add in your hours of operation, pricing, and any other relevant information. Remember, you want to be as thorough as possible to give potential customers everything they are looking for. Add all of your business information, and make sure it’s 100% accurate. Every time you list your business information on a website, this is known as a local citation. Being consistent with your name, email, and phone number helps keep your business consistent in Google’s eyes. Any variations in your contact information will dilute your search power. Yelp Profile Pictures Pictures speak a thousand words and if you want to stand out, yours need to be the loudest. 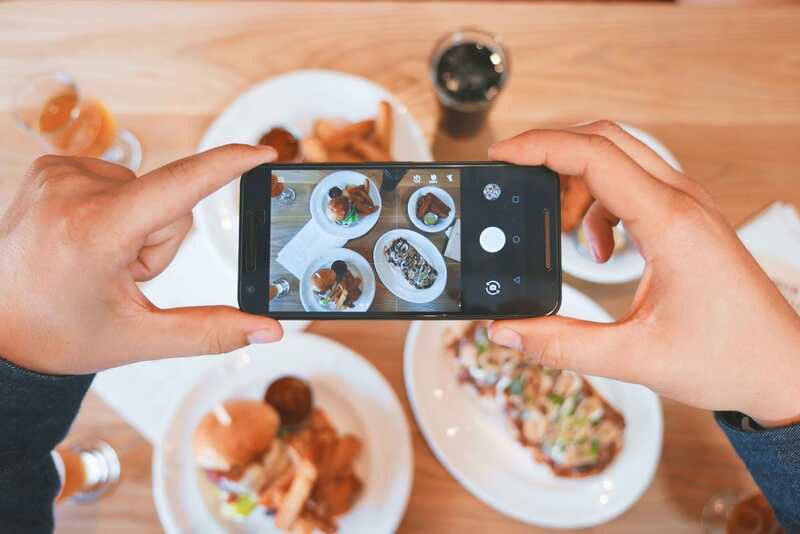 Whether it’s mouth-watering food shots or an image that captures the serenity of your new spa, your photos should be high quality and professional. We recommend adding anywhere between 5-8 to start. Reviews are the lifeblood of Yelp and local SEO. Everyone wants 5 star reviews. Undoubtedly the best way to get a good review is to keep providing stellar products and services, but you can also give your customers a little nudge by asking them for their feedback. If you read Yelp’s blog, they will dissuade you from directly asking for reviews from happy customers but it’s not against their Terms of Service. If you hit a homerun with a customer and they’re happy, why not encourage them to go on Yelp and talk about their experience? Asking someone face to face is the best chance of getting a fantastic review. Encourage your staff to keep this in mind each time they have a good experience with a customer. Let them know you’re on Yelp. Yelp offers stickers and badges for free, if you have a great interaction with a customer, you can give them a Yelp sticker as a reminder and invite them to share their experience. Yelp is a popular search engine, but people are also searching for recommendations on Google and will hopefully stumble across your website. If you’ve done a great job building up a positive Yelp listing, then why not showcase it on your website? The more positive reviews you have, the more content you can use to develop a strong Yelp marketing strategy. Using a social media aggregator is a great way to display your 5 star reviews to your website visitors. A social media aggregator curates all of your customer generated content, posts, and images using your favorite social media channels such as Facebook, Instagram, and Twitter. By adding your social channels and Yelp reviews, your visitors can get a glimpse into what people are saying about your business without having to navigate off your site. Imagine someone searching for “Hair salons, NYC” clicks on your website. 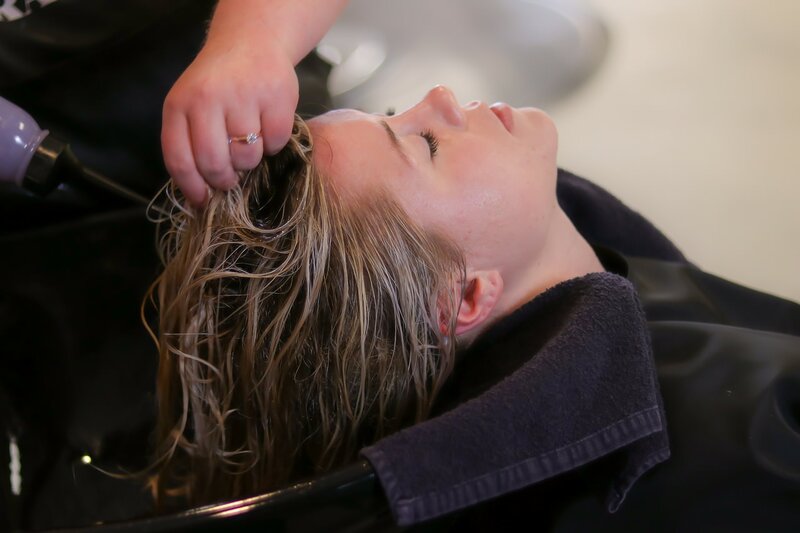 After browsing your homepage they are able to see the latest 5 star reviews, Facebook chatter, and some customer-generated images of their beautiful new hairstyles. Social proof is the one of the strongest ways to convince someone to do business with you. Juicer’s social media aggregator allows you to moderate and filter your content. You have complete control over what gets posted on your live feed. If you type into Google “dry cleaners Providence” the first few results are all Yelp pages. This means that Yelp pages are being indexed and crawled by Google, so your Yelp profile should be optimized similar to a website. 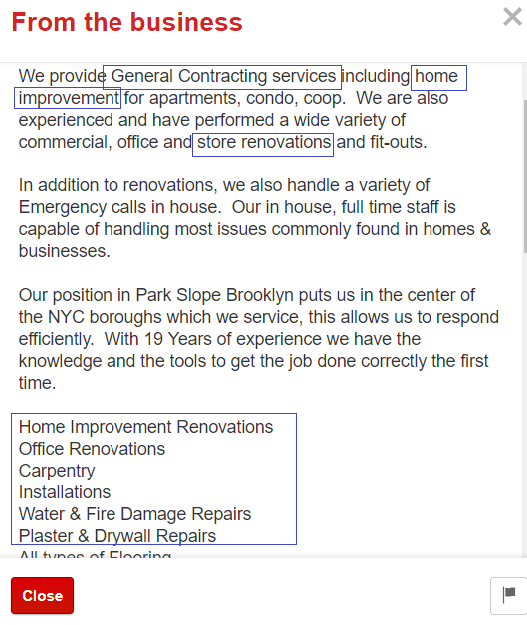 Using keywords within your profile will help improve your rankings both on Google and within Yelp searches. They have listed all of their most important and relevant keywords in their “From the Business” section. By thoroughly filling out the additional sections “History” and “Meet the Business Owner” you have the opportunity to really expand upon keyword rich content and give readers more information about you. Don’t just set up your Yelp account and walk away, you should be as active on Yelp as you can. Yelp customer reviews are the most important aspect to maintaining a high search position, and the best way to moderate your customers’ experiences is to actively engage with them. 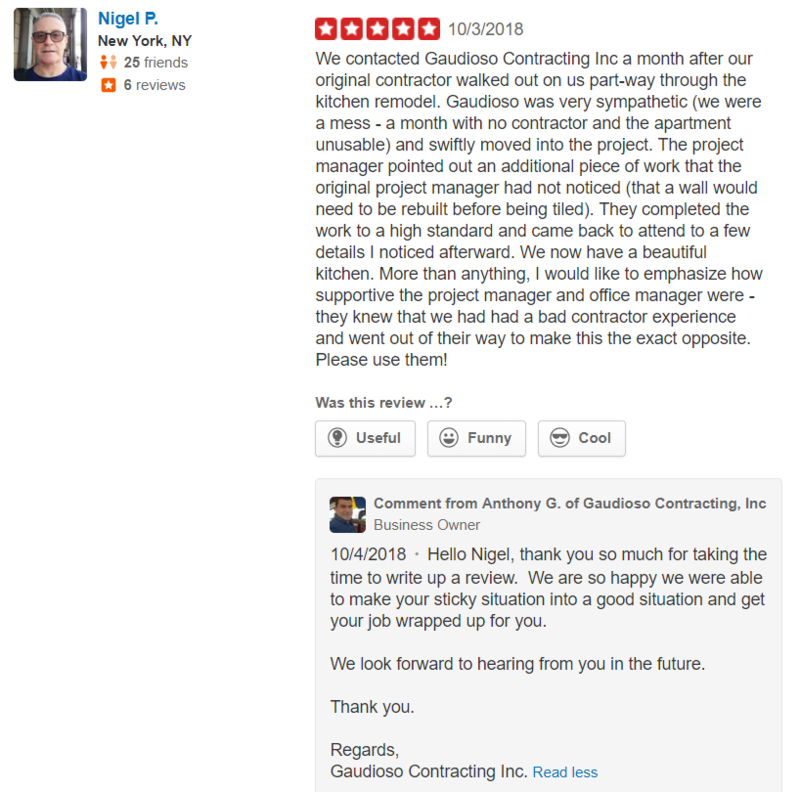 The images below show how Yelp page managers can respond to both a negative and positive review. 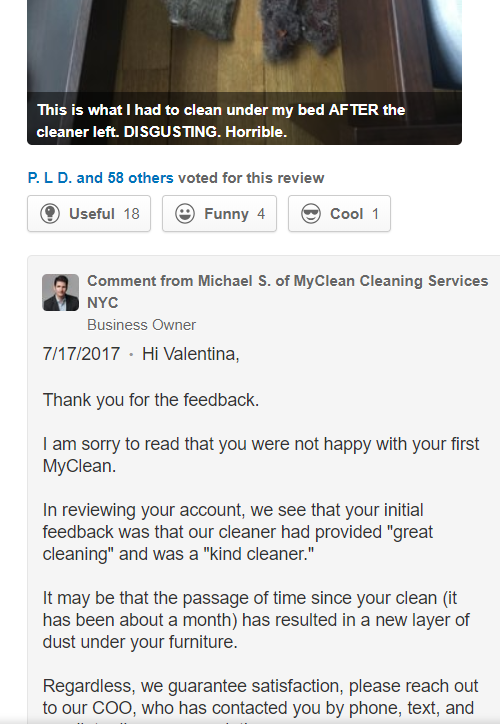 Responding to positive reviews is a nice personal touch to show visitors that you appreciate customer feedback and are actively communicating on Yelp. In regards to negative reviews, you should always attempt to rectify the situation and empathize with the customer. If there are extenuating circumstances in which the customer isn’t providing all of the details, you can elaborate to help clarify the situation but this should be done delicately. The example below is a perfect response using an apology, further explanation, and contact information to rectify the problem. You should never respond in a demeaning or negative tone no matter how terrible the review is. The way you communicate with customers is public for everyone to see so being professional at all times is extremely important. Part of Yelp’s free business tools for business owners is posting Offers and Announcements. Are you hosting an event or remodeling your store? Maybe you’re throwing an end of season blowout sale. Use the Announcement tool to invite customers into your business or to keep them up to date on your store’s latest activities. All you have to do is create the announcement and post it on your Yelp page. 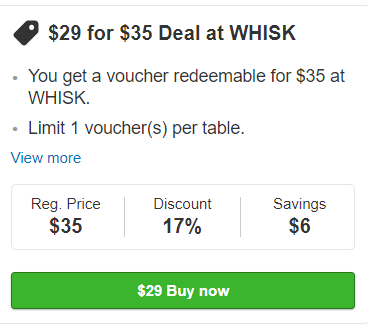 Give potential customers who find you on Yelp an incentive to visit your store with offers and special deals. 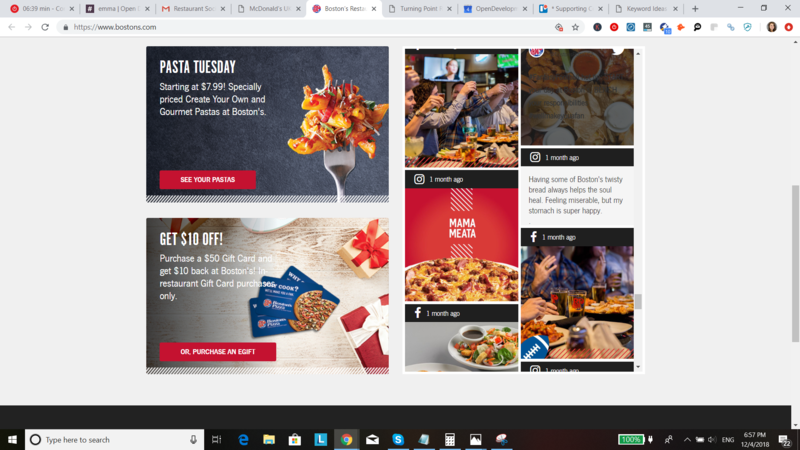 Discounts, gift certificates, and buy-one-get-one deals are fantastic ways to connect with new customers and grab some more positive reviews for your page. It also gives you a way to stand out from your competition. Running a business requires managing many different moving pieces and Yelp reviews can help keep you in check of how different areas of service are performing. Being open to feedback is an important factor, not only for Yelp, but for your overall business success. Properly setting up your Yelp business listing, optimizing it, staying active and providing excellent products and services are the keys to success. By following our Yelp marketing tips, you turn Yelp into a best friend instead of an enemy.